In May this year, Keychoice Underwriting managing director Jonathan Davey lashed out at “stupid” tactics in the commercial market for forcing him to outsource his company’s underwriting function to Towergate. Davey is far from alone in expressing frustration with the cut-throat commercial lines market. Many chief executives of big-name UK insurers have bemoaned the heavy competition, and say the sector desperately needs rate increases. An Insurance Times investigation into the FSA returns of some of the biggest names in the business shows clearly what the fuss is about. The FSA filings of six prominent UK insurers reveal that in 2011 the three main commercial lines - motor, property and liability - were, in most cases, heavily in loss-making territory. A notable exception was Allianz, which reported an overall profitable commercial combined ratio of 94.1% and sub-100 combined ratios in all but its commercial liability business. Other profitable bright spots included Direct Line Group’s commercial liability business, and Aviva’s commercial property book, but these highlights were few and far between, with many insurers above the 110% mark on an overall basis. In several cases, the results were worse than the previous year. 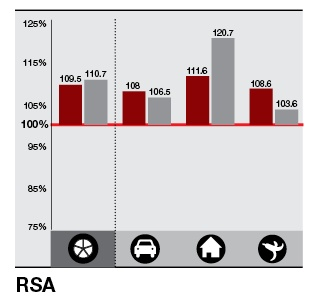 RSA’s overall commercial combined ratio, for example, increased to 109.5% in 2011 from 108.7% in 2010. 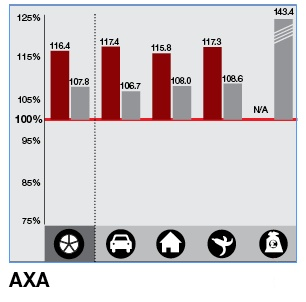 AXA’s increased to 116.4% from 103.3%. The study also reveals significant influence from old underwriting years. Aviva’s commercial liability combined ratio was bumped up by 37.9 percentage points to 138.7% by the need to add to reserves for prior years. 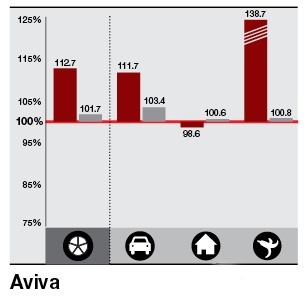 Aviva’s current year combined ratio for commercial liability in 2011, which excludes the impact of prior years, was 100.8%. Its overall combined ratio was also worsened by prior years, at 112.7% versus 101.7%. Similar trends were seen at AXA, where prior-year reserve strengthening added 8.6 percentage points to the company’s overall combined ratio. 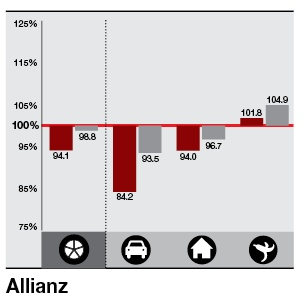 On the other hand, Allianz’s overall commercial combined ratio received a 4.7 percentage point reduction from prior-year reserve releases. Similarly, Direct Line Group’s overall commercial combined ratio was cut by 8.5 points by reserve releases. Some insurers were keen to point out that they did not feel the FSA returns reflected their performance (see panel). Sticking points include the fact that the calculations in the study exclude ‘other technical income’ - income, other than premium, from running an insurance business, such as business administration fees and commissions for acting as an agent for other parts of a large group. But they did concede that commercial lines were challenging in 2011. A spokesman for Aviva said: “Commercial motor profitability was adversely impacted by poor performing business lines in van, taxi and some schemes (which we exited where appropriate). Commercial lines are a particularly thorny issue for insurers because low rates, driven by heavy competition, are combining with recession-related effects such as lower demand and claims inflation to create poor results. In addition, the fixed costs of running an insurance business are remaining static. “If insurers have not brought their fixed cost base down in line with the reduction in premium volume, then combined ratios start to turn nasty,” Ernst & Young insurance practice director Tony Sault said. Sault predicts that rates are unlikely to harden in the near term, and that more insurers will start to exit selected lines of business. 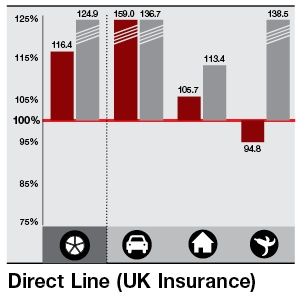 With claims from last year’s riots still filtering through, the prospect of more claims from the recent flooding, and few signs of any upturn in rates or the economy, commercial lines are likely to continue to weigh on UK insurers’ overall profitability in 2012. Next year’s FSA returns could make even more uncomfortable reading. Most commercial combined ratios were well above the 100% break-even point. 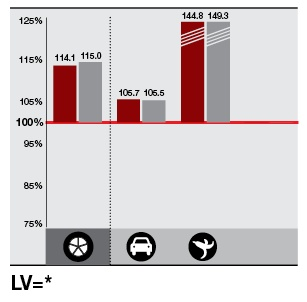 Prior years had a significant influence on results. ● This method of calculating COR from FSA returns is widely recognised and used in respected studies, such as actuarial consultancy Towers Watson’s annual motor insurance industry report.